There is a growing number of road accidents being reported everyday. We wonder, what has happened to our drivers these days? Are they really prone to accidents or they just neglect their duties and responsibilities on their passengers' safety? This is alarming that needs our attention. Statistics from the PNP-Highway Patrol Group revealed that there were over 20,008 road accidents reported in 2009. This means that there are around 50 road accidents that occur in the Philippines on a daily basis. As we speak, 2 vehicles have probably gotten into an accident during the past hour. With 78% of total daily person trips depending on buses, jeepneys taxis, tricycles, trains and padyaks, it’s no exaggeration to say that a large portion of the Philippines would literally stop if public transport were to halt their operations. Almost everyone use public transport to go to work or school, or do daily errands. “It’s trusting the drivers to get us to our destinations on time; it’s trusting them to have checked and fine-tuned their vehicles; it’s trusting them to follow road signs-- it’s trusting them with our lives, says Eros Zuniga, National President of Safety Organization of the Philippines Inc. (SOPI). DOTC studies show that 80% of road accidents in the country are caused by human error. This advocacy campaign of Biogesic and the different government agencies, hosted by broadcaster Cherrie Mercado, was launched on October 11, 2010 at Fiamma bar in Makati City. Human error is defined as the imbalance between what the situation requires, what the situation intends and what a person does. With the realization of how the element of human error played a big role in the day-to-day lives of Filipinos, the public-private coalition Ingat Pilipinas was formed. 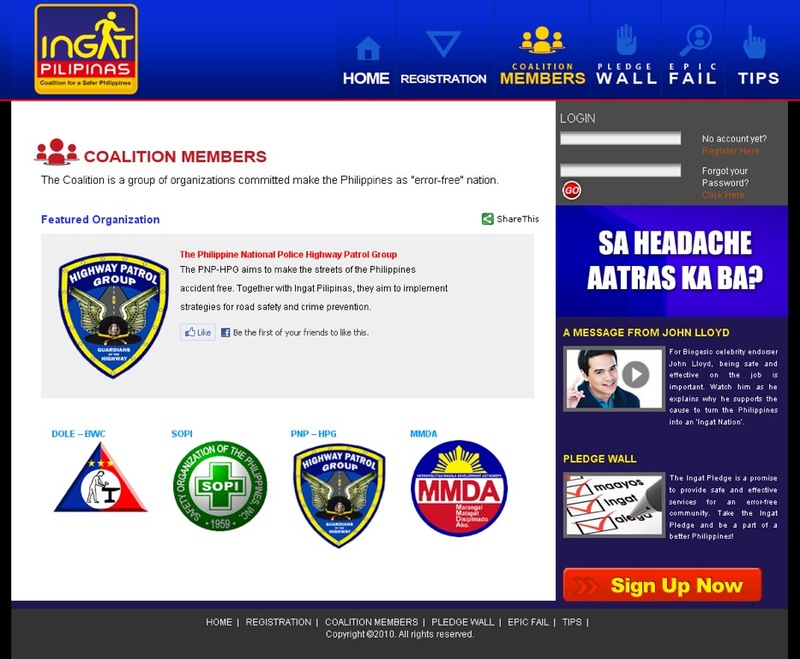 Composed of the PNP-HPG (Highway Patrol Group), MMDA (Metro Manila Development Authority), the Department of Labor and Employment and its sub-agencies the Bureau of Working Conditions (BWC) and the Occupational Safety and Health Center (OSHC), from the public sector and SOPI (Safety Organization of the Philippines) and leading headache relief brand, Biogesic, from the private sector, Ingat Pilipinas is working to reinforce the values of safety consciousness and effectiveness among Filipinos and in the country as a whole. "Jeepneys are a public necessity as much as they are a cultural symbol,” notes MMDA Engr. Emilio Llabor. Jeepneys cannot be taken away from our roads, even if there was a plan in 1996 to eradicate all jeepneys because as others have claimed, they cause heavy traffic. It is obvious that jeepneys are not the cause of terrible traffic especially in Metro Manila, but the wrong and undisciplined road system. Recent research shows that of the overall motorized trips within Metro Manila, the busiest city in the Philippines in terms of public transport, 41% were taken on jeepneys. Meanwhile, 19% of trips were on tricycles, 13% on buses, and 5% on taxis. In absolute terms, jeepneys are the main mode of public transport with over 9 million linked trips on an average day. and 23% said breaking traffic rules or “hindi pagsunod sa batas trapiko." There are also other factors that need to be considered why road accidents happen. 85% of respondents agree that not feeling well or “masama ang pakiramdam” makes driving more challenging. Drivers identified headaches, fever, and body pain as the most common maladies. “It’s unfortunate how many of the factors that result in accidents—overspeeding, engine failure, violation of traffic signs, and ‘sama ng pakiramdam’– could have all been otherwise avoided,” asserts Joey Romana of Biogesic. This lack of consciousness about safety is readily seen in how drivers perceive and treat “headaches.” 77% of those surveyed continued to drive even if they had a headache—this means that they continue driving even if they’re not at their optimal condition. Dr. Gerald C. Vilela, Clinician of Unilab-Biogesic says that this is a concern because headaches or the common “sakit ng ulo” leads drivers to commit what’s known as perceptual misjudgment. Perceptual misjudgments are instances when drivers fail to notice critical information, such as road signs or speed limits, because their mental resources are focused elsewhere. In this case, drivers get too distracted by their headaches (and the pain these bring) to focus on their driving. Ingat Pilipinas recognizes that human error, and how it manifests on the road, is a big problem— with different facets and different stakeholders who need to start working on them. Taking inspiration from the popular Biogesic tagline “Ingat,” Ingat Pilipinas believes that at the heart of human error is a disregard for safety, which is why raising awareness, ensuring personal commitment, and rolling out programs on safety are integral pillars of the advocacy. “It’s a fact that 80 percent of accidents are caused by human error, but we shouldn’t forget that this also means that 80% of all accidents could have been, could be, and should be prevented. Kailangan lang talaga ng ibayong pag-iingat,” says Joey Romana of Biogesic. With this, the first phase of Ingat Pilipinas will be focused on improving road safety in the public transportation sector. Working specifically with the PNP-Highway Patrol Group, Ingat Pilipinas will be distributing “Ingat Kits” – a packet that contains headache management tips and a safety first-aid kit—to PNP-HPG Patrollers. Meanwhile, together with SOPI, Ingat Pilipinas will be spearheading seminars about workplace safety. In the coming months, more projects will be undertaken by Ingat Pilipinas with coalition members specifically MMDA and DoLE. Simultaneous with these projects, Ingat Pilipinas will also be rallying more organizations and individuals to join their cause for a safer and more effective Philippines. 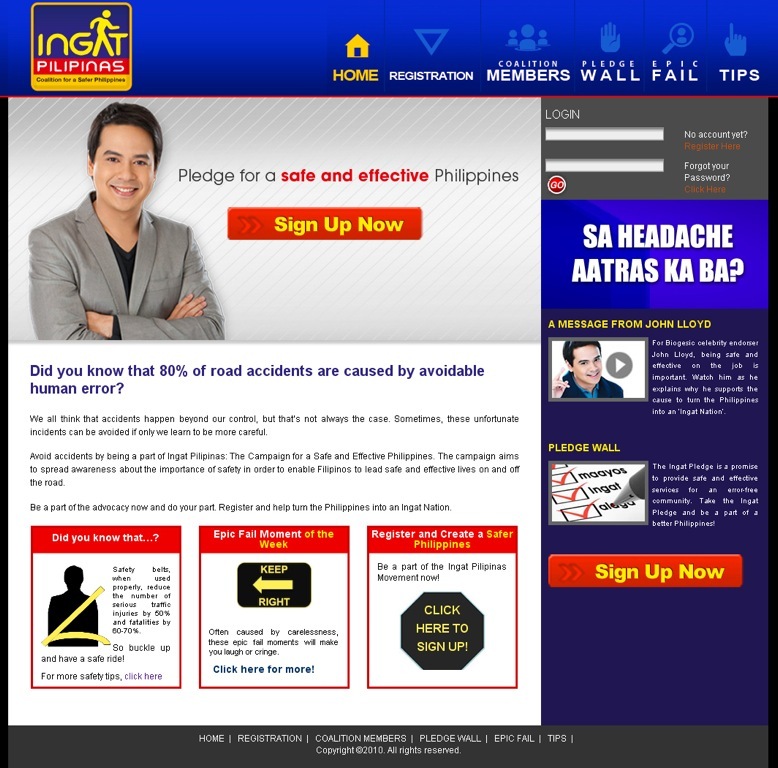 With this everyone is encouraged to sign up and be counted in the online portal of Ingat Pilipinas, http://www.ingatpilipinas.com. “It’s time that we go beyond saying “Ingat,” it’s time we work together and actually do something to make our roads, workplaces, and eventually even the whole country itself, safer and more effective—starting with ourselves. Our decision to be safety-conscious can make a big difference,” say the coalition members of Ingat Pilipinas. To find out which companies and individuals have taken the challenge for a safer and more effective Philippines, log on to www.ingatpilipinas.com. The Biggest Public Pledge event, showing a commitment to a safer and more effective Philippines, was held also on November 27, 2010 (Saturday) at SM Mall of Asia in Pasay City.